It’s in my nature to play around with recipes, but I’m also smart enough to know if it’s not broke, don’t fix it. That’s the case with the sourdough waffle recipe from King Arthur. They were not my first foray into sourdough waffles. 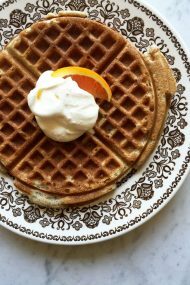 After hearing rave reviews about the light and airy crispness of sourdough waffles, I had a go with Sam Sifton’s recipe. 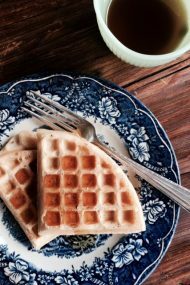 They were fine, but nothing to make me abandon my own waffle recipe which has been the #1 recipe on my site since it first appeared 10 years ago, and doesn’t require advance planning. The sourdough waffle train had left the station after I gave Sam Sifton’s recipe a try, and I decided not to get onboard. I have plenty of other ways to use up starter discard (mainly these crackers). 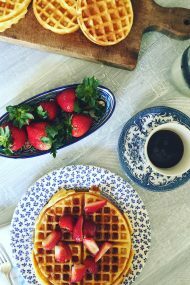 Then sourdough waffles popped into my head again a few months ago, sometime between fall ending, and the days getting shorter (thank heavens light is returning!). This time I decided to give King Arthur Flour’s recipe a try. The ingredients are very similar with the main difference being Sifton’s batter is much wetter since he uses more starter. He uses a 1:1:1 ratio of flour, starter and buttermilk, whereas King Arthur Flour uses a 2:2:1 ratio of flour, buttermilk and starter. Remember starter is part water, too. I can’t say my mind is completely changed or that I’m a sourdough waffle convert suddenly, but honestly, I’m more of an egg gal for breakfast. Mikey was the waffle lover, as is Isabella. Still, these sourdough waffles have a place in my weekend breakfast plans now. They’re incredibly light and crisp, and won’t leave you feeling weighed down. Perfect to plop a fried egg on top of. 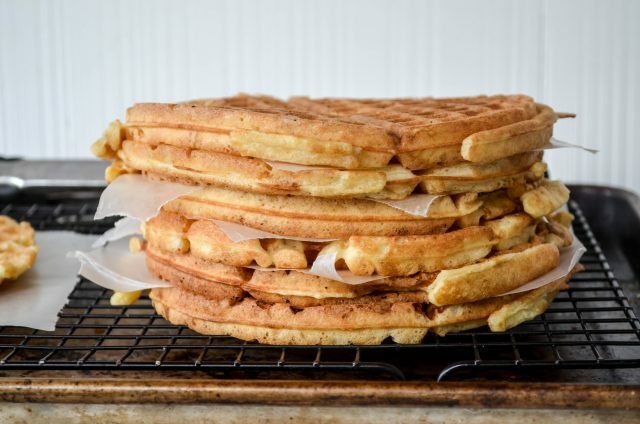 As with my regular waffle recipe, you can freeze the leftovers. Store them in a ziptop bag between layers of waxed paper so they don’t stick, and heat in the toaster (straight from the freezer). In a pinch, they serve the same purpose as bread for school lunches. We’re preparing for a big snow storm here in a few hours, and provided we don’t lose power, sourdough waffles sound like a good snow day brunch plan with some hot cocoa and a movie. 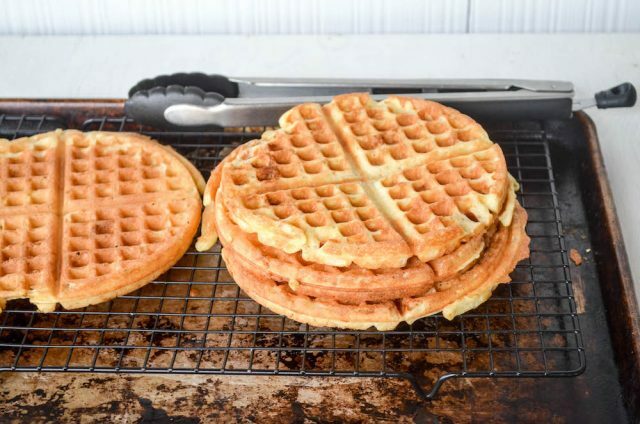 For the overnight sponge, preheat your waffle iron. 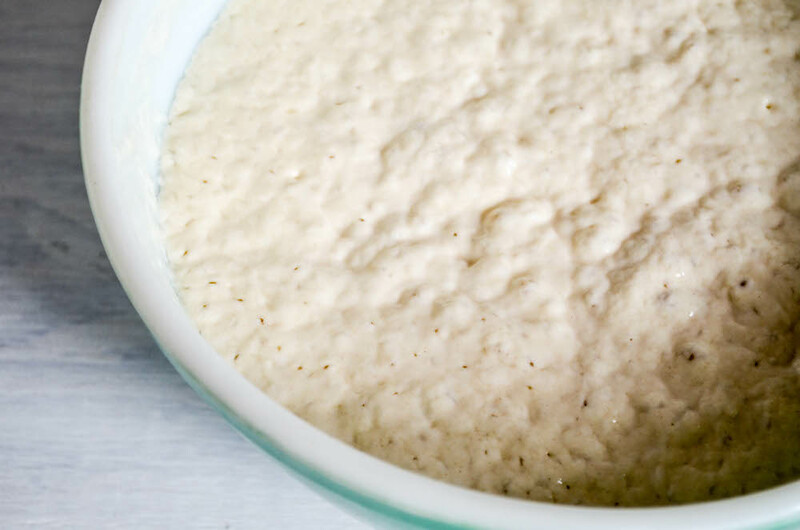 Combine the starter, flour, sugar, and buttermilk in a large bowl. Stir to mix well. Cover and let rest at cool room temperature for about 8 to 12 hours, or overnight. Timing depends on the temperature of your home. The next morning, in a small, separate bowl, beat the eggs, and butter. Add to the overnight sponge along with the salt and baking soda. Stir to combine. 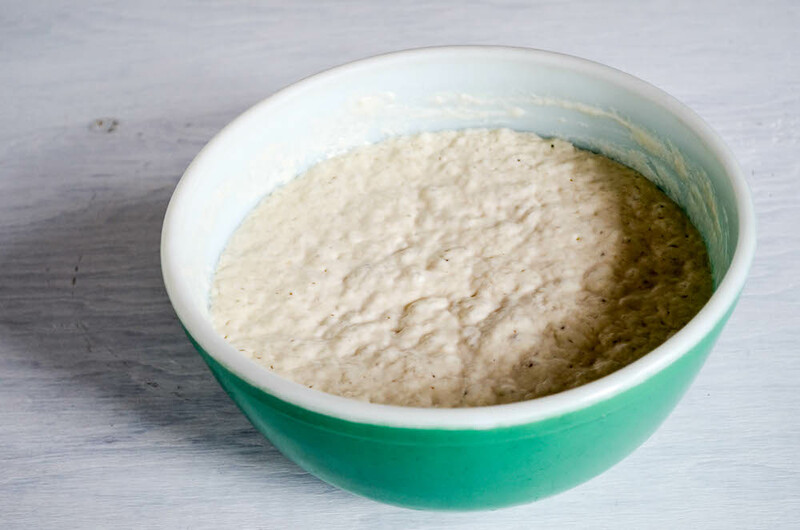 The batter will bubble, remember sourdough is alive. Grease your waffle iron. Pour batter into it, and bake according to the manufacturer's instructions. Instructions say to preheat the waffle iron when making the overnight sponge… probably better to do it the next morning! Um, yes. That was a typo, and now corrected. Thanks for catching it.